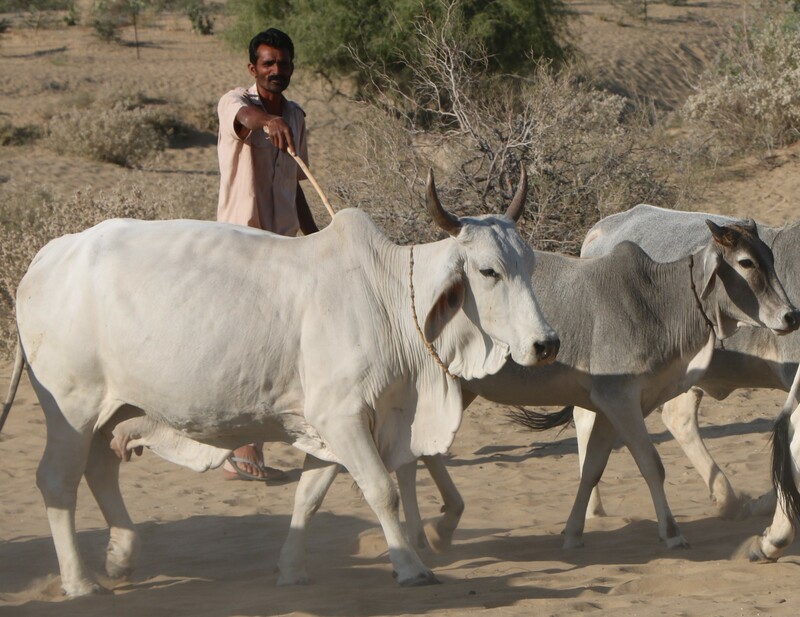 “Tharparkar desi dairy breed of India is a strong and sturdy as it can survive all the odd conditions be it less food, water or high temperature. The milk yield is excellent in farm conditions. Lastly it is resistant to several tropical diseases and draught. However unfortunately the breed has been ruined due to lack of attention and its number is negligible in the country. Hopefully it will be restored because it gives high fat content milk and its excreta when turned into farming inputs definitely increases farm production,” asserts Mr. Devaram Purohit. 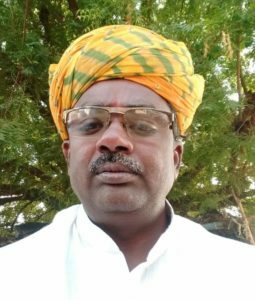 He has been working for more than two decades to preserve indigenous cows and have established commercial dairy farms of native cows. He specializes in Kankrej and Tharparkar breeds of India. He has now set up his own company with aim to make Indian desi cows and bulls commercially viable with its urine and not milk! He is based at Abala Bhabhar District, Banaskantha, Gujarat. The quality and quantity of milk of Tharparkar cows is exceptional. “Farmer should identify pure breed of cows and bulls before the purchase and then after look after them really well. Subsequently he will never face any fallout. It can live comfortably even in a small place if allowed to move freely and provided clean surroundings,” asserts Mr. Purohit. Tharparkar cows are the most endangered breed of India. To find the pure cattle is tough but with physical characteristics it is possible to identify the same. It is pure white or grayish in colour. “When the cow is pregnant or during winters its colour deepens while the bulls have dark gray colour particularly on the forehead and hind quarters. All along the backbone there is a light gray stripe as well,” he shares. Cows have flat and broad forehead and the head is medium size. Horns are curved upwards and blunt points move inwards. In the males the horns are thicker, shorter and straighter than in the females. Horns and face are practically on one plane. The skin between the eyes is often wrinkled, the wrinkles running perpendicularly. The eyes are full and bright. The eyelashes are black and there is a small ring of black on the eyelids. “Long , semi pendulous and broad ears are distinctive to Tharparkar cows. Besides, the hump is firm and fairly well developed. It is located in front of the withers. The dewlap yet another unique feature of Indian desi cows in Tharparkar breed is of medium size. It swings well and has fine and smooth skin,” says Mr. Purohit. The sheath in the males is of moderate length, and is semi-pendulous. The navel flap in the females is prominent. The size is variable. Shoulders are light and legs are comparatively short, but in good proportion to the body. The hooves are hard and black, of moderate size and have no tendency to turn out. The length of this breed is more than other desi cows. Tharparkar cows have average height of 138 cm and weight of 408 kg. Bulls weigh 450 kg and have height of 142 cm. Life tenure of cow is 20-22 years while bull lives for 20-25 years. “Everyday contact with people is mandatory for this dairy breed else it can become shy and little,” he highlights. To revive Tharparkar breed in India it is imperative to pay attention on breeding. As per Mr. Purohit it is ideal to have natural mating provided the bull is of excellent quality and has exclusive features. “Best of the best bull is referred as physically well built and whose mother yields more than 3200 litre milk in one lactation cycle. Such bulls must be reared with lot of care and precaution. In-breeding affects the bull’s features negatively so it must be under close supervision. I strongly feel the genetically inferior bulls must be kept in a separate shed where it doesn’t comes in contact with superior quality bulls or cows. A small negligence can lead loss of the good offspring if this factor is ignored!” he warns and insist on being alert. Artificial insemination and embryo transfer are man-created techniques are not long lasting but a short term solution to increase the population of cows in India. “We cannot overlook the importance of bull in dairy or horticulture farming. The earlier we accept the bulls in the farm the better it is!” Once the female calf is above 2.5 years and male calf is above 3 years, it is ready for mating. On an average Tharparkar cows can give birth to calf and yield milk for 16-18 years provided it is fed with nutritional and healthy diet. On an average the milk yield of Tharparkar cows is 2800-3200 litre in one lactation cycle. It can be more too in some of the cows and those are recognized as best quality of cows. “Milk yield of the cow depends on many factors such as genes, fodder intake and living conditions. Also when a calf is born the cow milk has less fat content but rich in nutritional content. If the calf is allowed to have this milk stomach full then its foundation years are quite strong. Subsequently it grows and develops in superior quality adult. Commonly minimum 35% of cow milk must be given to the calf and if it is 50% then it is the best,” states Mr. Purohit. Further fodder plays an important role in improving the milk yield. Feed management must be done as per the age, milk yield and season. Fodder given should be mix of concentrate, green and dry fodder. “We have to ensure the fodder makes balanced diet for the cows. During winters when the green fodder production is high then cow can be fed on 20kg green fodder, 4 dry fodder and 2.5 kg concentrate if it yields 5 litre milk in one day. Similarly in summers the quantity of green fodder is reduced and dry fodder increases. The quantity needs to be increased with the increase in the milk yield,” he clarifies. As Tharparkar breed belongs to Rajasthan state it has natural liking towards Sewan grass. Scientific name, Lasiurus scindicus Henrard is a perennial, bushy and multi-branched desert grass. Once planted in the farms it can be harvested for more than 10 years. It can be cut once in 30-days and is one of the best dry matter yields. Also it is drought tolerant. Sewan grass fulfills the nutrition requirement of the cows along with guar seed cake. Mr. Purohit recommends special diet for the cows before and after delivery. “In our farm, we give 100 gram ghee mixed in 1 kg wheat or bajra (pearl millet) porridge when cow is seven months pregnant. It is usually given in the morning. With this cow not only gains the required strength and energy but also the delivery process becomes easy, calf is born healthy and post delivery the quality of the milk will be good. Similarly post delivery, to cleanse the internal body system cow is fed with wheat porridge mixed with jaggery for first two days and only dry fodder. Later to which every day in the morning for one month cow is given a mix of 200 gram jaggery, 100 gram dry coconut pieces, 50 gram each of ajwain (bishop weed) and methi (fenugreek seeds) . With this the internal body heat of the cow is released and it regains the strength,” he shares. Likewise to cows, bulls must also be given an exclusive diet for its good health and fertility. “It must be fed with ghee or oil mixed in wheat or bajra porridge,” he states. Any one of sesame, groundnut or mustard oil can be used in the porridge. It can be fed once or twice in a week. Tharparkar breed seldom falls sick and in case if it is not well then the treatment must be kept natural. Sharing the examples Mr. Purohit says, “When it falls sick the first symptom is that it stops eating fodder! This is the best way for the farm owner to understand that the cow/bull requires medication. There is a natural remedy for every ailment such as give luke warm water if it is suffering from cold or buttermilk in case of diarrhea etc.” If the cows and bulls are given nutrient rich fodder in winters then rest of the year it stays healthy else if it becomes weak during October-December then summers are tough to pass on! Indian desi dairy cattle are fond of cleanliness and like to move around freely. If tied or kept in dirty surrounding then it gets stressed and subsequently the quality and quantity of milk is hampered! Tharparkar is the premium milch breed of India. It can perform really well in the commercial dairy farms too if given the due consideration. “We need to believe in our desi dairy breeds and work on it with complete sincerity and dedication. Presently handful of individuals are working on emotionally and not professionally therefore the breeds are protected on small level but it has the potential to bring a revolution in country in dairy as well as horticulture segment with milk and urine respectively. If our industrialists and the government join the hands of these individuals in the endeavor to revive our indigenous milking breeds of cows then surely our economy will flourish, national health will improve and our country will shine bright! Let us do it,” signs off Mr. Purohit.